Find your peace at Sunrise Pointe where families may choose from three- and four-bedroom North Myrtle Beach vacation rentals that sit right on the oceanfront in North Myrtle Beach, South Carolina. There are eight stories of oceanfront North Myrtle Beach condominiums in this oceanfront complex, which are built atop a multi-level parking garage. 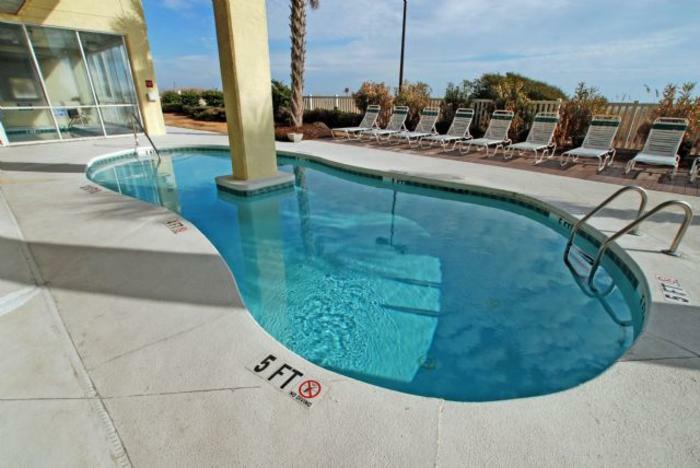 These oceanfront North Myrtle Beach condos are beautiful and can accommodate between six and 10 people. The gorgeous furnishings of these oceanfront North Myrtle Beach condo rentals include a well equipped kitchen with full-size appliances, including a dishwasher. Keep your beverages cold and warm up your snacks and meals with ease. All of these condos in North Myrtle Beach, SC have a washer/dryer unit and many of these North Myrtle Beach rentals have high-speed Internet access. Large oceanfront balconies offer nourishing views of the North Myrtle Beach, SC coastline and the oceanfront sun deck, which includes a swimming pool, lazy river and hot tub. Nearby piers dot the oceanic landscape and beach umbrellas, beach towels and beach chairs change the white, sandy beach to a kaleidoscope of color. Enjoy the glorious North Myrtle Beach, SC climate when you vacation at Sunrise Pointe North Myrtle Beach resort. Sunshine all day and coastal breezes all night are wonderful accoutrements to any family beach vacation in North Myrtle Beach, South Carolina. Rise early each morning and greet your North Myrtle Beach vacation day with an oceanfront sunrise. It is a spectacular show worthy of paying admission, though when your North Myrtle Beach vacation includes reservations at the oceanfront Sunrise Pointe, a front row seat to this natural phenomenon is complimentary. Walk the wide beaches any time of day and listen carefully as the crashing waves, seagulls and distant laughter melds for symphonic background music. Just a few blocks away is Highway 17 where you find shopping, dining and family amusements on both sides of the road. From seafood buffets on Restaurant Row to waterfront dining at Barefoot Landing, North Myrtle Beach, SC can feed a crowd delicious South Carolina cuisine. Outlet malls are nearby and antique shops are scattered everywhere. In North Myrtle Beach, South Carolina is it easy to shop for jewelry, art, home décor, gifts, clothes and those one-of-a-kind items that you just cannot do without. But it all starts with reservations at Sunrise Pointe oceanfront North Myrtle Beach condominiums. Elliott Beach Rentals is not affiliated with onsite management or the HOA of Sunrise Pointe.